This is a study provided by SI Imaging Services providing a study of the feasibility of using KOMPSAT-5 SAR data to map sea ice in the Chukchi Sea in late summer. In this study, a sea ice mapping model based on Random Forest (RF), a rule-based machine learning approach, has been developed for the Korea Multi-Purpose Satellite-5 (KOMPSAT-5) Synthetic Aperture Radar (SAR) data in Enhanced Wide swath mode obtained from August 6 to September 9, 2015 in the Chukchi Sea. 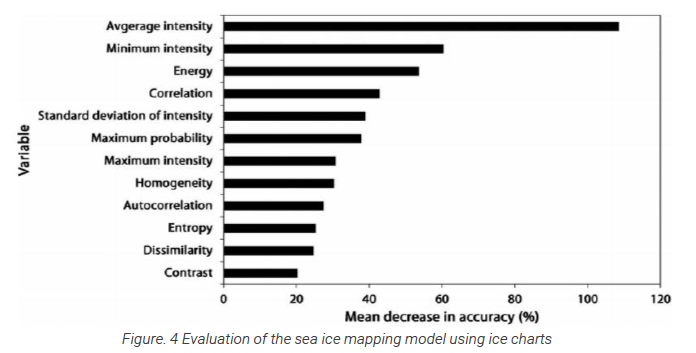 A total of 12 texture features derived from backscattering intensity and the gray-level co-occurrence matrix were used as input variables for sea ice mapping. The RF model produced a sea ice map with a grid spacing of 125 m, demonstrating excellent performance in the classification of sea ice and open water with an overall accuracy of 99.2 percent and a kappa coefficient of 98.5 percent. Sea ice concentration (SIC) retrieved from the RF-derived sea ice maps was compared with that from ice charts. The mean and median values of the differences between the SICs derived from the RF model and the ice charts were −8.85 percent and −8.38 percent, respectively. Such difference was attributed to both the uncertainty in the ice charts and classification error of the RF model. KOMPSAT-5 has a nominal revisit time of 28 days which is longer than other X-band SAR satellites such as TerraSAR-X/TanDEM-X (11 days) and COSMO-SkyMed constellation (1 to 16 days). However, it can capture the same area twice a day due to swath overlay. We obtained a total of 78 KOMPSAT-5 EW SAR images (HH-pol.) 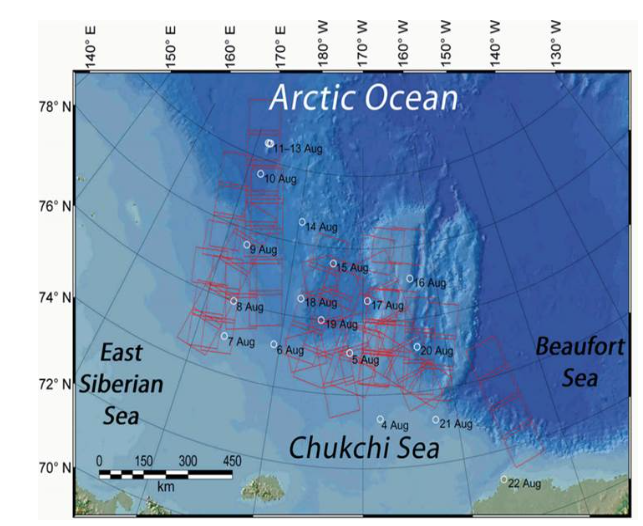 from August 6 to September 9, 2015 in the Chukchi Sea (Figure 1). 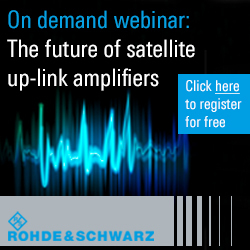 The SAR images were acquired at both ascending and descending orbit in various radar look angles from 17 degrees to 49 degrees and were delivered as an ellipsoidal geocoded product with a pixel spacing of 6.25 m. To reduce speckle noise, we performed a 2 × 2 block averaging of the SAR images. A sea ice mapping model for KOMPSAT-5 EW SAR data over the Chukchi Sea of the Arctic Ocean in late summer was developed using binary classification of texture features in backscattering intensity and GLCM based on RF. The sea ice mapping model exhibited excellent performance in classification of sea ice and open water. The average and minimum values of backscattering intensity and energy from GLCM were identified as more influential variables than the others. SIC calculated from the RF-derived KOMPSAT-5 sea ice maps were compared with that derived from the AARI weekly ice charts. The mean and median values of the differences between SICs derived from RF model and ice charts were −8.57 percent and −8.83 percent, respectively. This study presented that the KOMPSAT-5 SAR images can be used to produce high-resolution sea ice maps of the Arctic Ocean.